The 20th anniversary of their debut came and went last fall. The alleged final album from the crew, A Better Tomorrow, appeared less and less likely to become a reality as internecine discord and disharmony dominated any headlines Wu-Tang was getting. An excellent in-depth feature at Grantland tracked down each living member of the Clan portraying a disappointing image of the Wu collective---fractured, scattered around the country, unable to connect all the necessary pieces to form Voltron, unable to finish their final album because of financial and creative disagreements. Then, out of nowhere, the newswires blew up with word that the Wu-Tang Clan had actually recorded a secret album (a double-album) produced by talented Moroccan Wu affiliate Cilvaringz and were planning to release just one copy of it. The plan is to tour the album around museums and music festivals before auctioning it off to the highest bidder. Suddenly Wu-Tang, the gritty rap dynasty and beloved cultural phenomenon of the 90s, became one of the most talked about things on the internet. The music industry is in crisis. Creativity has become disposable and value has been stripped out. Mass production and content saturation have devalued both our experience of music and our ability to establish its value. Industrial production and digital reproduction have failed. The intrinsic value of music has been reduced to zero. Contemporary art is worth millions by virtue of its exclusivity. This album is a piece of contemporary art. While the news has been received positively by many in the entertainment industry, it has definitely sparked a debate as diehard Wu-Tang fans feel abandoned, let down, and sold out after decades of unwavering support. The journalist for Forbes who originally broke the story traveled to Morroco to visit Cilvaringz, the man who's truly responsible for this unique album. He got to hear a 50-second snippet from Once Upon a Time in Shaolin (heard in this short documentary) which had a Ghostface verse followed by vocals from none other than Cher. And that's all. It was insinuated that nobody in the world had ever heard material from the album before. That's not exactly true. Cilva posts regularly to the Wu-Tang Corp message boards which I've followed on-and-off for many years and he had been pretty open about the genesis of this project, right up until he decided to make it a one-off thing unavailable to the fan base at large. Originally he had assembled a collection of brand-new-yet-vintage thumping Wu beats which he had intended to have Killah Priest record over. His hopes were to have Killah Priest travel to Morocco where he could be immersed in its ancient, Biblical atmosphere and create a new masterpiece, a Part 2 for his 1997 classic Heavy Mental. When Priest proved too hard to keep consistently in touch with, Cilvaringz scrapped that idea for something bigger. He wanted to record a full Wu-Tang Clan album with the original mid-90s rugged and raw essence. A fan before a musician, Cilva knows what the true Wu diehards want to hear and hoped to provide this one last time before the veteran rap crew retires or disperses. A YouTube video appeared wherein Cilva shared 24 minutes worth of beats for the project, many of them phenomenal, often with orchestral, cinematic richness. I posted the video here and wrote about it back in 2010 (it has recently been taken down). As the album began to take shape over the years, Cilvaringz could be found on the Wu-Tang Corp forum posting snippets and asking for opinions, answering fans' questions, and detailing the participation of Wu members. His goal was to make this a final all-encompassing snapshot of the Wu movement, with contributions from not only the entire Wu-Tang Clan (including unreleased ODB material) but also the other key branches of the family tree like Killah Priest, Sunz of Man, La the Darkman, Killarmy, Brooklyn Zoo, plus Redman and others. He talked about the album being completed but unable to be released to the listeners until he'd received final approval from Rza. Then came the big Forbes press release (picked up by seemingly every news agency out there) and it was now clear that the Wu-Tang fans who he'd been leading along may in fact never get to hear this long-awaited album. The single-edition record is encased in an ornately decorated large metal box and, supposedly, the only way the public will be able to hear it will be through headphones at heavily-guarded tours. Their intention was to preserve the album's integrity as a work of art and try to swing the momentum away from the illegal downloading of albums which have watered down the quality of music overall and certainly upended whatever worth hip hop had in terms of quality. It's an admirable idea and as a Wu-Tang fanatic it is was definitely refreshing to see them grabbing so much attention for this unique release. One can't help but question Cilvaringz' motives though, as he clearly has no regard for the fans who now may never get to hear the last great Wu-Tang album. The Cilvaringz double-album that's getting so much attention is The Wu: Once Upon a Time in Shaolin. As an original Wu fanboy with a mastery of beat-making, his album is likely to have a cohesive feel and perhaps an overarching story. Could be amazing, if any of us ever get to hear it. There's also a regular commercial release in the works to celebrate their 20th anniversary, A Better Tomorrow, which is being spearheaded by the man known as the Abbott, the Clan's founder and wisdom-spewing multidimensional artist, The Rza. Even though it's intended as a normal release, fans may not get to hear this one either because the crew can't get together to finish it. Now, with A Better Tomorrow only a couple months away from its release date, Raekwon is the only member who hasn't recorded anything yet because he wants to assure he'll be compensated properly. With an acting role in the upcoming film Brick Mansions, The Rza has been making the rounds on radio and TV lately to promote the film. Of course, with two albums from his Clan in the news, the eloquent and busy Abbott has had to respond to inquiries about the status of A Better Tomorrow, his relationship with Raekwon, and how the almighty Wu-Tang Clan, a 20-year musical brotherhood, could possibly be undermined by squabbles over money. I recommend checking out some of Rza's interviews (links below). He's as knowledgeable and well-spoken as any rap artist you'll ever hear. I feel smarter every time I listen to him. He breaks down the essence of the Bhagavad Gita on a rap radio show, for cryin out loud. The Clan has had their share of conflicts over the years, but this one feels more grave than usual. Leaving aside the Cilvaringz project, this is likely the last we'll ever hear of the Wu-Tang Clan together, the final chamber. And the disagreement essentially boils down to this: Raekwon wants to assure he's going to be paid according to his market rate before laying down a verse. His own interviews (and Rza's) make it clear that it's not even a personal thing, it's his own management team driving a hard bargain with the Wu-Tang management team. While Raekwon has also continued to take shots at Rza for the trajectory of his creative direction going toward a more softer sound, all indications are that this discord strictly boils down to finances. To Wu-Tang fans the world over, the idea of Raekwon's business manager preventing the completion of the final Wu-Tang album because of money is pretty unsettling. 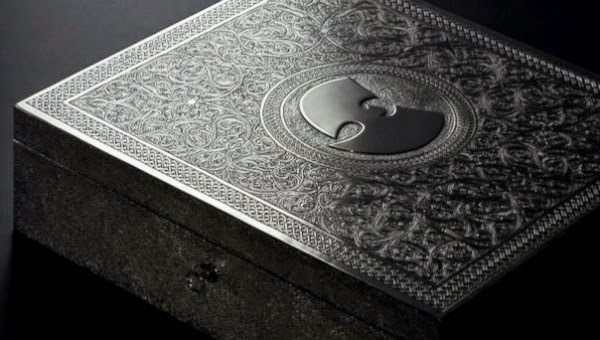 It's amazing that there's so much positivity surrounding the Wu name with the single edition album and (potentially) a 20th anniversary album gaining lots of press, while simultaneously there's negativity and drama since fans won't get to hear the former and the latter might not even happen. Esquire article "It All Flows Through Rza"
Great write up! Thanks for making it easier to keep up w/ the Wu. Drawing RAW art to "Black Gold" right now... Good looking out! Surprised to see the Wu name in a blogroll on what is essentially a philosophy website. Clicked through to you. Nice assortment of topics here. @Bobby: Nothing beats the "Only Built 4 Cuban Linx" RAW & Joyce piece. Love that one. @El Keter: Thanks for checking it out. I worry sometimes that the assortment is too much for people.